How do I send a message to a user in a group in Conversations as an instructor? In Conversations, you can send a message to one user or multiple users in a group. If your recipient list contains more than 100 users, your message will automatically be sent as individual messages to each user. As the sender, you will also be included in the total recipient count. Currently you cannot message users in multiple groups. 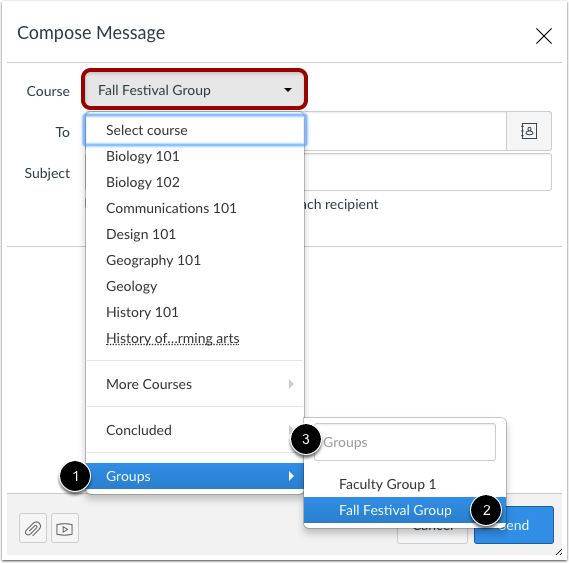 Once a course has concluded, you cannot message student groups in that course. In Global Navigation, click the Inbox link. In the Course drop-down menu, select the Groups option  and select the name of the group . You can also search for a group by typing the group name in the Groups search field . Note: Groups are organized in alphabetical order and display after courses in the drop-down menu. To add a user, you can search for the user in the To field  or you can use the Group Roster . To search for a user, type the user's name in the To field. Canvas will automatically populate matching names. If multiple names appear, use the arrow key to select the user's name. Then press the Enter key. The user's name will appear in the To field, highlighted in light blue. To send a message to multiple users, type the names of additional users in the To field. If you accidentally select the wrong user, press the Delete key (on a Mac keyboard) or the Backspace key (on a PC keyboard) to remove the user. You can also hover over a user's name and click the white x to remove the user from the list. To select a user from the group roster, click the Address Book icon next to the To field . From the address book, locate and select the user's name . Names are arranged by last name. 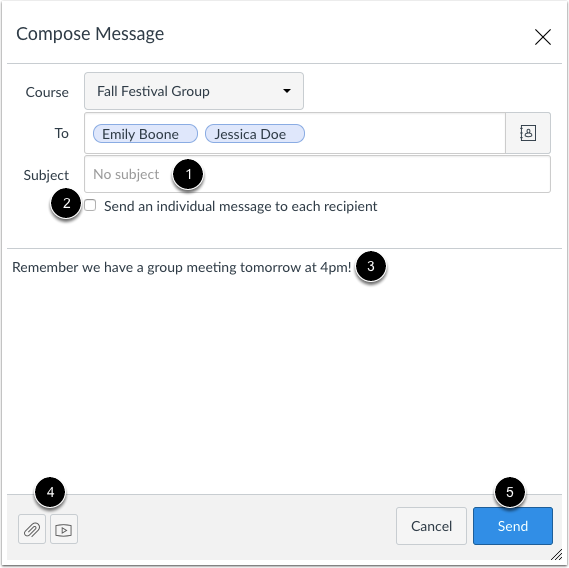 Note: To send a message to multiple users in the course roster, press the command key (Mac) or the control key (Windows) and click the name of each user you'd like to add to your message. Pressing the keyboard key will keep the roster window open. In the subject line field , enter a subject line for your message. If you are sending your message to multiple users, but you do not want each user to see who else was included in the message, click the Send an individual message to each recipient checkbox . If your message includes over 100 recipients (including you as the sender), this checkbox will be selected by default. In the message field , type your message. All content is sent in plain text. Note that if you include a URL in your message, the URL will automatically become a clickable link after you send the message. If you want to include an attachment or media file, click the attachment or media file icons . When you are finished, click the Send button . Previous Topic:How do I send a message to a user in a course in Conversations as an instructor? Next Topic:How do I send a message to all course users in Conversations as an instructor? Table of Contents > Conversations > How do I send a message to a user in a group in Conversations as an instructor? Re: How do you send a group email message?